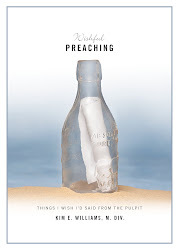 Wishful Preaching: Is Your God Competent? Here's a truth for you, and if you don't get anything else I say here - get this" God is big enough for you. We hear a lot of theology about how powerful God is - God is omnipotent. We hear a lot of theology about how God knows everything - God is omniscient. We don't hear about how capable God is, and God is capable. We need a new 'Omni' word: God is Omni-competent. No matter how messy, raw or difficult we may be when we come to God in prayer, God can handle it, and make something good out of it. A mother took her young daughter to shop for an Easter Sunday dress. The two of them had a grand time and decided on a simple, pure white dress, trimmed around the neck and hem with lace. "I'll look like an angel," the daughter proclaimed. The two returned home with the carefully boxed dress, ready for the next morning's Easter festivities. The mom placed the box on her daughter's dresser and gave her strict instructions to leave it alone until the morning. Later, alone in her room, the young child couldn't resist just looking at it. She opened the box and again imagined how beautiful she would be. She couldn't resist just lifting it out of the box to see it better, and then - of course - she couldn't resist just trying it on. She looked at herself in the mirror and was so pleased that she decided to leave it on - just for a few minutes. She danced and twirled and practiced sitting - - sitting at the chair by the table with her art supplies. Soon she was sitting pretty and drawing and painting, and - yes, you guessed it - getting spots of paint, green paint, on the front of her dress. Once she saw what she had done - she panicked. She quickly took off the dress and as if she could make it all right, folded it back in the box and placed it on top of her dresser. Then she began to suffer, and worry and think. Finally, she didn't know what else to do so she took the box out of her room and shuffled to face her mother. Her mother surveyed the damage. Three green spots of paint were staining the front of the previously pristine dress. "My dear! What have you done?" she asked. The daughter burst into tears and told her mother everything about how she couldn't help it, and how she wished she hadn't and how sorry she was. It was a story that every parent has heard, and every parent has wanted to make it right, to go back in time and change the past, and every parent has not been able to. But, this parent, this creative mother did something better. "My daughter," she said, "you did wrong and now this dress is a mess. It won't be the same. I hate it for you, because I know how much you wanted to look like an angel. It can't be the white dress you had, but let's see what we can do with what we have." Then the mother took daughter and dress back to the art table and began to work. With a careful hand she drew from each green spot a single line and on the top of each line she painted a rose. On the bottom of each line she painted leaves and on she worked until the front of the dress was beautifully adorned by three delicate flowers on a pristine white canvas and that was the dress that she wore to Easter the next day. God is Omni-competent. We take our messes to God. Then we discover a miracle. When we can't, God can.